The sun always rises in the East and that is especially nice after a hot evening. 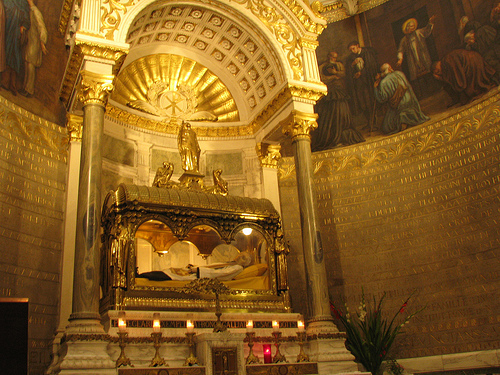 Don’t misunderstand, I am a Catholic priest in the little city of Ars, France – likely one of the holiest places on earth. It has a feel like Assisi. Less medieval to be sure but still nice, quaint, simple and centered around a holy man. There is a peace that only holiness and simplicity can bring. Still southern France is like southern almost everywhere else – hot, humid and has bugs. So I slept well, if a bit uncomfortably and rose to a cool morning. When you rise with the Presence of Jesus Christ not ten feet away it adds a whole new dimension to your reality. So the bright morning shines a little brighter and though the back might ache from sleeping funny (and being twenty pounds overweight) there is a quick spring in the step. Off to prayer and then the Mass. It was simple, no sermon, plainchant in the modo simplex. The sound of all male voices takes a priest back to the seminary, and in a good way. Time intersects with eternity and then one is off to breakfast. After, there is a walk into town. Three priests, so different, so varied in personality and perspective yet all the same, exactly the same – one God, one Faith, one Baptism, one Priesthood. There is a cup of coffee and pleasant conversation. The you go to visit God on earth in the Sacrament and pay respects to the mortal remains of a giant, a hero, a man you hope to be. The feeling is small – I am the lesser son of greater fathers. And it is also big – God gives me the same grace as my fathers and I can, I must be a greater saint than they. Time moves on, the sun grows higher and the skies get warmer and warmer. A simple rosary in a black robe, praying with so many little brothers who hope to walk one day the path you trod. They do not admire, that if for legends and we are very much flesh and blood, they respect, they listen. Praying, singing to the good God, talking the spiritual things all through the afternoon and then back to the silence of heart and prayer do these souls go. What an odd life we lead. One foot in time another in eternity. We go back and forth, forth and back. It can be all so dizzying some times and one might feel privileged or un-worthy or ungrateful. I suppose one should feel all of these things. Such an odd life. Yet it is also sacrifice, gift, offering. A young man learned his grandmother passed away today. He shed a loving tear, he prayed and talked and shared. He will not see her buried, he will not have that visible consolation. Why? Because he is offering himself – in time and for eternity. Perhaps we are all God’s mad-men, chasing after old dreams and dead heroes. Perhaps not. Perhaps we are the light of the world and the salt of the earth, treading this beautiful and tired land and finding new Faith and living Spirit. I should go to bed and you, perhaps, should pray. Night falls on Ars but eternity dawns everywhere – for we will say the Mass tomorrow, perhaps you will say it yet today. And I am glad to be here, with these good men. Hope is very much alive – for our time and for eternity.